Name Ebrahimkhel, Khojesta Fana Mrs.
Chargé d’Affaires ad Interim of the Embassy of Afghanistan in the U.S.
Mrs. Khojesta Fana Ebrahimkhel Ebrahimkhil was born in Kabul, Afghanistan in 1964. She attended Kabul University and received her BA in Political Science specializing in Law and Diplomacy in 1982. She left Afghanistan for Germany, applied for Asylum and studied German, Mathematics, Chemistry and Physics at the University of Karisruhe. In 03 Feb. 2010 she was listed as an Interpreter for Dari at the Landgericht (Court) in Karlsruhe. Her father, Mohamad Jan Fana, was a military officer, military scholar, author and poet who traveled abroad to represent Afghanistan. She presented lectures on the social and legal position of women in Afghanistan and participated in a number of panel discussions on that and other subjects. She led discussions for the City of Karlsruhe and presented lectures to associations of professional women, at community college events, on International Women’s Day and to law associations. Mrs. Ebrahimkhel was an active member of the International Women's Club and the German-Afghan-Association. She is married to Abdul Naser Ebrahimkhel, who is a counsellor in the Afghan Embassy in Washington. They have four children. Her daughter studies Law and Political Science in a university in Germany, while two sons are in college in the US and one young son is in elementary school. Mrs. Khojesta Fana Ebrahimkhel was named the Chargé d’Affaires ad Interim of the Embassy of Afghanistan in the U.S. following the end of H.E. Ambassador Said T. Jawad’s tenure this fall. She will serve in this position until the arrival of a new ambassador. 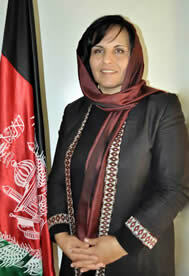 Mrs. Ebrahimkhel began her career in the Ministry of Foreign Affairs in 2006. She served as Chief of Staff for the Ministry from 2006 to 2008, and arrived at the Embassy of Afghanistan in Washington, DC, in August, 2008 to serve as General Counselor (Consular). Mrs. Ebrahimkhel speaks fluent Dari, Pashto, German, and English.